NOTE: Please contact the local family farm in your area for information for the Christmas season. The administrative office contact is for general information and joining the Kentucky Christmas Tree Association. Around the third week in November, the farmers of the KY Christmas Tree Association open their gates, barns, and fields to folks who appreciate the experience of cutting a fresh, homegrown Christmas tree. A tree grown and nurtured in Kentucky soil, with Kentucky hands. There’s a lot of talk these days about the environment and going “green.” We smile a little bit at that because we’ve always been green. We’ve always appreciated Kentucky’s rich agricultural history and are doing everything we can to pass that torch on to the next generation of growers. 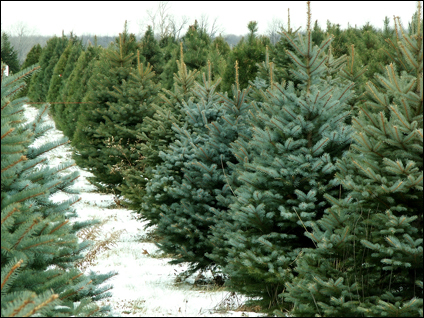 For many families, an outing to the nearest Christmas tree farm marks the official start of the Christmas season. Friends gather. Meals are shared. Decorations are brought down from the attic. Traditions are revisited. We’re honored to be a part of that. To our faithful customers, we thank you. We value your business and your friendship. 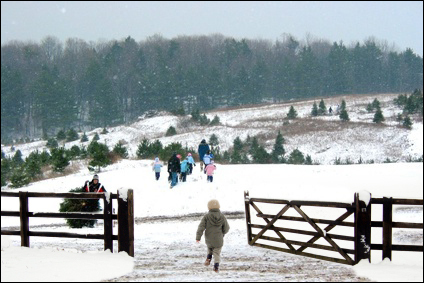 To those folks who have never visited a Christmas tree farm, we invite you to start a new tradition with us. Put on your coat and hat, bring your camera and a friend. Spend some time walking in our fields, taking in the scenery, while you find the perfect tree. We’ve walked the tree rows hundreds of times ourselves and never get tired of it. It’s good for the soul. Our gates are open for you.